Unlike traditional collars, the Gentle Leader® Easy Walk™ Harness never causes coughing, gagging, or choking because the chest strap rests low across the breastbone, not on the delicate tracheal area. 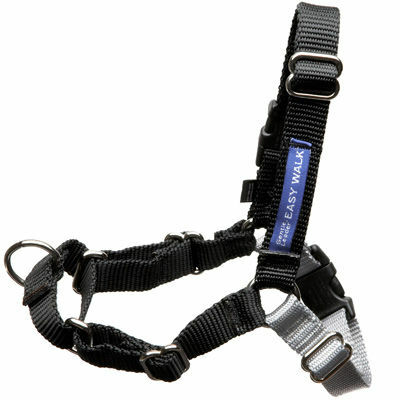 The Gentle Leader® Easy Walk™ Harness is designed to gently discourage your dog from pulling while walking on a leash. And, it’s easy to use, requiring virtually no acclimation period or specialized training. If your dog forges ahead of you, gently pull the leash to the side to turn the dog towards you. As he stops pulling, be sure to release the tension on the leash. Use praise and reward your dog with treats and/or petting. To slow your dog when he is pulling ahead, apply gently pressure to the leash, pulling gently toward one side of the dog. Release the pressure on the leash when the dog is walking nicely next to you. Like all collars, leashes, and harnesses, the Gentle Leader® Easy Walk™ Harness is a tool designed to help you train your dog to walk politely. We recommend finding a qualified trainer who can help you work with your dog in a positive way. We do NOT recommend using the Gentle Leader® Easy Walk™ Harness with a retractable leash. With a retractable leash, the dog is “rewarded” with additional leash when he pulls ahead. We want the dog to learn to NOT pull ahead. In addition, a retractable leash will always apply a slight constant pressure, teaching your dog it is okay to continue pulling. Traditional harnesses can actually encourage dogs to pull harder because of the “opposition reflex.” That’s the reflex that makes sled dogs do what they do. The Gentle Leader® Easy Walk™ Harness redirects the pressure through the front leash attachment. And, our patent pending martingale closure tightens slightly across the chest and shoulder blades when your dog attempts to pull forward. Click here to view the color chart. Please Select...Petite 3/8" x 12=16" Small 1/2" x 15-20" Medium 3/4" x 20-28" Large 1" x 26-36" XLarge 1" x 34-46"